Actually I didn’t. When I graduated from high school in 1962, I wanted to enlist, but my mother put the quietus on that one and I went to college–but with an attitude. With no intention of studying I figured I’d get kicked out, so by my second year I joined the Navy Reserve and became a Hospital Corpsman. I wanted to beat the draft and with my grades I figured there was no way the school was going to let me stay much longer. What I didn’t count on was a big program they had at the time to raise the population of male students and the bottom line was, if you wore britches you couldn’t get kicked out! So, after five years of fooling around, I graduated and went on two years active duty. 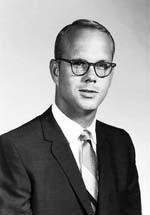 First there was Hospital Corps School in San Diego and then to Field Med School at Camp Pendleton, December, 1967. After Field Med, I was stationed at Naval Hospital Memphis and later to D 1/4, 3rd MarDiv, Vietnam. I was attached to D 1/4, 3rd MarDiv in I Corps. Our Area of operations (AO) was as far northwest in the country as you could get. It was bordered on the west by Laos and on the North by the DMZ. I got there shortly after the siege of Khe Sahn and there really wasn’t much happening at the time. I had been in country about a month before being mortared the first time. Our ordinary mission was “search and destroy” or fire base security. We were ambushed a few times walking through the jungle. On or about this date, we decided to go to Fire Base Argonne, the Northwestern most fire base in RVN. It had belonged to us back in December, and we had no real reason to believe it otherwise now. The battalion commander, Lt. Col. Sargent, sent a Huey with a pre-assault recon team up to look things over before we were to go. The Huey got shot down. The Colonel said something about how they couldn’t do that to his men and the assault was on. 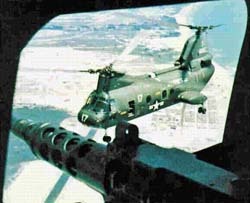 We had six CH-46s to launch our operation. Each CH-46 could only hold about 12 or 13 men, and we sent two at a time, so we didn’t exactly overwhelm the NVA holding the hill with a massive show of immediate force. I was on the third round of choppers in. In other words, by the time I got there, we had landed about 50 men and had been engaged for maybe ten to fifteen minutes at the most. As the chopper began its descent, you could hear small arms fire everywhere. Our machine guns were going, and stuff was happening everywhere. Looking out the window as we neared, you could see a pitched battle in progress. The ground was exploding everywhere on the hill as rounds of small arms, mortars, RPGs, and other munitions landed all over it. As we hurtled toward the LZ, they told us to roll off in a hurry when the bird got around six feet off the ground. We were either going to get off while it was going down or going up, but it wasn’t going to stay there waiting on us to move off. So people started jumping off it when it was still five feet or so above the ground. By the time it touched down, it was empty of passengers and ready to get out of there fast. It just sort of bounced. 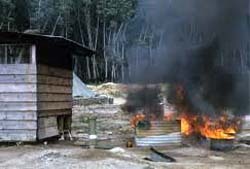 On the ground, resistance increased with small arms fire everywhere, mortar rounds going off, and utter chaos as we fanned out across the fire support base. As we neared Hill 1308, deadly blasts of enemy automatic weapons fire from well-constructed bunkers halted our progress but one thing that runs through one’s mind: get to the top and kill all the people you can identify as being on the other side before they get you. I discovered that there is a drive which takes hold of a person and makes him do something he would not usually do – go through bullets to stop the bullets and hope there’s not one there destined for him. To stop and try to hide would be suicide. It’s the fastest who survive in this action–or at least, who have the best chance at it. So we shot our way to the top by dark had destroyed the last enemy fortification. The hill was now ours but we had a tiger by the tail. Smoke was oppressive from burning trees, set off I suppose from all the explosions. We were still taking small arms fire and mortar rounds from neighboring hills. During the assault we lost six killed and eleven wounded. We did find fifteen dead NVA scattered amidst the ruined bunkers. 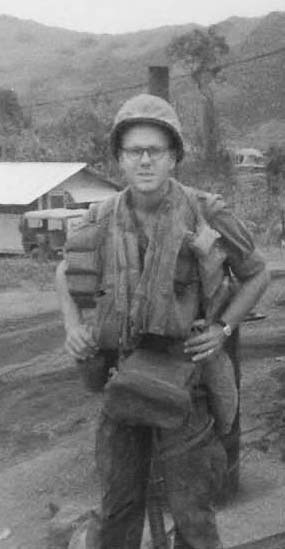 Dr. Sheppler, our battalion physician, had come with us (wanted to see what war was like, he said) and a couple of Corpsmen, Rick McGaffick and Bob Biebel, and I found a depression in the hillside and began to construct a hooch over it before the NVA got mad and tried to take it back. 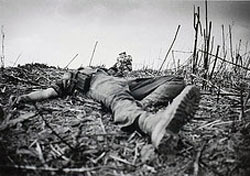 After it was over, as I remember, there were several dead Marines laid out on the LZ to be taken away. One of them was a fellow who, just a few days earlier, had asked me to cut all his hair off because of the heat (I also served as a company barber), and I had refused. I told him that if he got killed, I didn’t want his mother mad at me when he got home with no hair. He went home with a good haircut. 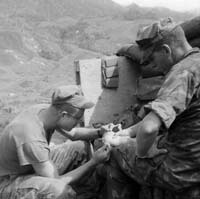 As we sat on the hill trying to establish some order to take care of the Marines, a couple of the highest ranking men on the hill came up for treatment of their “wounds.” One of them had a strawberry scrape, as I remember, and the other must have had something equally heinous. I looked down at the LZ and saw the dead Marines waiting to be taken out, while these so-called leaders were whining up to the Doc so they could get another medal – a Purple Heart. I don’t remember everything I said to these two “casualties,” but I do remember some others telling me I needed to be a lot more judicious in what I said to whom. All these two were interested in, or so it appeared to me, was furthering their own careers by collecting medals, and the dead Marines on the LZ apparently didn’t mean squat to them. I remember saying something about how I ought to put myself in for a Heart for a scratch I incurred on my finger coming up the hill. When I got back to the states later, I discovered someone had indeed put me in for a Purple Heart and it had been approved. About all that can be said for it was it was legal. I received it; however, in 1998, I wrote my US Senator Trent Lott and asked him to begin whatever process was necessary for me to return it and have the award expunged from my service record. God had protected me all the way through the Vietnam experience, and my taking that award was almost, to me, a slap in His face and an utter show of disrespect for those who gave so much more. The word I got back was that an award could not be legally expunged. After several more attempts I gave up the effort. The next morning, Dr. Sheppler, McGaffick, Biebel, and I were trying to dig a hole in which to jump in case of mortar attack. The going was slow; the mountain was like solid rock. We were digging between a position where two officers were standing and where the big guns were. The two officers and the guns were about 25 feet either side of us respectively. 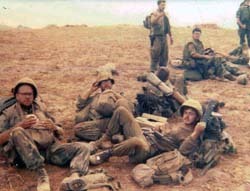 All of a sudden an NVA 82mm mortar round smashed into our area exploding right at the feet of the two officers. The more senior was decapitated, and the other was killed with no apparent mark that I can remember. (This is chronicled in the book entitled Matterhorn). The four of us digging the hole decided it was time to try it out, so we jumped in. That’s when the reality of how shallow it was set in. It could not have been more than eight or so inches deep. We flattened out as much as possible to wait whatever was ahead. Then another mortar round landed and went off. This one was between where the two men had been and our “hole.” The NVA were trying to get their mortars zeroed on our gun pits, and we were between where their rounds were impacting and where they wanted them to. They had to go through or over the four of us in the hole! The next round landed inches from the lip of the hole on the right side and I was the right side man. It could not have landed more than a foot away, and all the dirt and shrapnel went somewhere else. God had kept me safe thus far. I wondered: where would the next round land? It landed on the left side of the hole! They had skipped right over us! Then they put a few among the guns and called off the attack for a while. We decided to quit trying to dig a hole in rock, and go back to trying to reinforce the hooch over the depression we had acquired when we first got there. 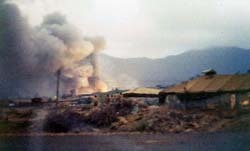 Among the four killed in the blast was Lieutenant Colonel Sargent and another dozen Marines were wounded. 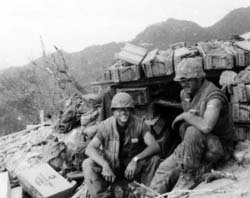 Later, as a medevac helicopter carried out those casualties, more mortar rounds fell, killing three more Marines and wounding another eleven. One of the officers that got medevaced out left his pack. Later, some guys were going through it, and found a bottle of Christian Brothers brandy. There were six or so of us in the hooch, and we all wanted to share with each other, of course, so we devised a way to stretch the brandy. So, we invented a new drink: the Argonne 82. The reason we called it that was because the NVA had 82 mm mortars, and we were on Fire Base Argonne. The recipe was the officer’s brandy and anything else. Canned peach juice would do. Kool-Aid. Whatever someone had would be fine, as long as the brandy was in it. It wasn’t very good, but we had a good time joking around about it. Argonne was a high stress situation. We were mortared several times a day from an adjacent hill. Someone sitting on his hooch would hear the whoosh whoosh whoosh of several shells leaving their tubes, and he would yell, “Incoming!” and everyone would jump in a hole for a few minutes. We had lots of rounds land on top of our hooch, but none ever got through. We just got dirty but who could tell or who even cared after a while? We called in air strikes day after day against the adjoining hill where the NVA were tunneled in. 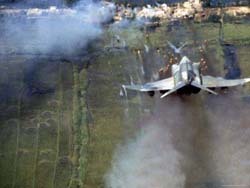 The jets would roar past, drop bombs, and as they were flying off, you could hear an NVA machine gun firing after them. Their tunnels were something else in that hill. Five hundred pound bombs didn’t faze them. We tried to spot them, and couldn’t. They were better at that stuff than we were. Our patrols got ambushed every day. We would send one out and the NVA would let them alone until about dusk. Then they would ambush it. It would be around 10 pm or so before they would get back to the lines with the wounded and dead. 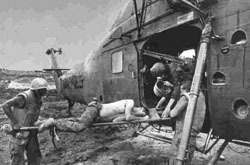 My job and that of the other Corpsmen would be to start IVs on the LZ with red-lensed flashlights (as though the NVA didn’t already have the LZ zeroed in) and arrange stretcher teams to get the wounded on board. Then we’d call in the medevac choppers and when they would swoop down to pick up their loads, the teams would get the wounded on as quickly as they could and head for holes because the mortars were going to start landing immediately. This went on night after night. Mortared all day, harassed all night! I had at least five mortar rounds land within five feet of me, and no telling how many landed on top of our hooch. This went on until the fourth of April, 17 days of non-stop stress. By then it had been some 25 days without a bath. Sleeping, eating, living in dirt! We had dirt in our beards and in our hair, in the skin under them. It was to take days after we got to the rear before we would be able to get all the dirt washed out of us. When we left Argonne, I wrote home that I left the hill with no regrets except that there were still some live NVA there. The doctor put Rick McGaffick, Bob Biebel and me in for a Bronze Star for our part in the action on Argonne, but there had been no heroism on our parts; we had simply done our jobs. It was downgraded to a Navy Commendation Medal with Combat V (for valor under fire) device. This action is written up in the virtual wall. It was Operation Purple Martin. I didn’t have a least favorite duty station. I must say that being attached to Delta Company in Vietnam was not, at the time, my favorite duty station. As I look back on it, however, I realize that that was the most satisfying and fulfilling time of my whole life. I’d have to say now that that was the place in the military of which I have my fondest memories because for me, there is no greater honor that I could have than to say I was a Navy Corpsman attached to the finest fighting force in the world – the United States Marine Corps. It was on April 9, 1968. I had rotated to the Battalion Aid Station at LZ Stud. It was more formally known as Vandergrift Combat Case by that time. I was sitting on my cot at LZ Stud writing an old college friend a letter one evening after supper and heard an explosion. When I looked up, I saw a ball of fire rising from the ammo dump about 200 yards from our battalion area. This dump was a big one. It was about 300 yards long and 200 yards wide and covered with pallets of ammo of every size and description. What had happened was that a CH-53 had been lifting a load which was not centered in the sling right. He dropped down to allow the ground crew to adjust the load, and when he did, his tail rotor hit a pallet of artillery shells. 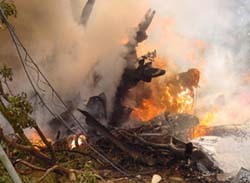 The chopper went around a time or two and crashed in the middle of all those explosives. The fireball I saw was the helicopter going up in flames as it exploded. Rick McGaffick, Con Costillow and I jumped in our jeep ambulance and raced to the crash site. We drove into it while what seemed to be scores of men were running out of it as fast as they could. We got to within about 75 feet of the chopper which was burning, and saw a man walking around naked except for his boots. Everything else had been burned off. We went up into the burning chopper, as I remember, to see who else might have been there. We wound up taking the man and the door gunner, who had a big gash on the back of his head to Charlie Med, roughly a mile across Stud, for emergency treatment. As we were leaving, a huge explosion went off. We were about 500 yards away, and it felt like it was right next to us. When we dropped our patients off, we returned for a second trip. By this time, artillery rounds were beginning to go off. We drove onto the LZ again. The place was a raging inferno. Explosions were everywhere. We got another man with a big shrapnel wound and took him to Charlie Med. On the return trip–this would have been our third time in there–to see if there were any others, someone intercepted us and said there was no one else left. We three Corpsmen, the only men on the entire base of several thousand to respond to the crisis, had gotten all the wounded out! No one died in the fire and explosions. 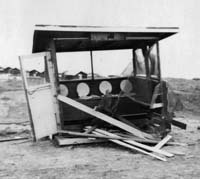 As we were racing back to our battalion area, a piece of shrapnel about 1½ feet long from an exploding artillery shell tore through the side walls of the canvas cover of the ambulance, about a foot from my head. I heard whoosh whoosh whoosh and each side of the canvas had a slit in it which wasn’t there before. When we got back, we could not believe we had done what we did. We just sat and shook for a while. Then we watched the fireworks until about midnight. Nothing else in my life will ever match it for pure adrenalin pumping excitement and sheer spectacle, I’m sure. Later that evening, some colonel came to the BAS and commended us. As a result of the action, we were awarded the Navy and Marine Corps Medal, the highest military medal awarded by our nation for heroism not occasioned by enemy action. I’ll have to admit I was proud of what we did then and I am still proud of it today. My two Navy Commendation Medals with Combat “V” device and the Navy and Marine Corps Medal in the action already described. The Navy and Marine Corps Medal: The highest non-combat decoration awarded for heroism by the United States Department of the Navy to the members of the United States Navy and United States Marine Corps. My first CO–who told me that he was the youngest 1st LT in the Marines; he turned 22 the day after I turned 24–was the greatest. No one else ever measured up after he left the company. (I have tracked him down. He has changed his name and when we talked via email didn’t seem all that interested in talking about it, so I won’t mention his name.) He was a born leader. He was one of those men who everyone KNEW was in charge and yet who was like an older brother. Yes, several. One in particular stands out. I had to go out to the USS Repose to get some glasses. When I returned, I joined back up with the company which was on something called Operation Sparrow Hawk. That meant that we spent 24-hrs a day at LZ Stud, and if somebody needed help in the bush, we would go immediately to give it. This was pretty easy duty. For the most part we just laid around. During this time I got a slight case of dysentery. One evening, I woke up with my belly hurting something awful. I made it the 50 yards or so to the nearest four-holer and got relief. But then, things got dicey. Now, I didn’t ever want to stick my hand out in the dark in Vietnam to try to grab hold of anything, and toilet paper was no exception. You never knew what you might get – a rat, a scorpion, a snake. So, in order to see what was in the place with me, I lit a match. One needs to understand something of our waste disposal system to appreciate what happened next. Under each hole was a half of a 55 gallon drum into which had been placed a few inches of diesel fuel. Waste elimination was accomplished each day by piling the drum halves into a pyramid and setting them on fire. (No one who has ever spent time in the Nam will ever forget that smell.) When they had cooled down, they were put back under the holes, and a few more inches of diesel fuel put back in them. The day of my evening’s experience, they had run out of diesel. Instead, they used gasoline. Now gasoline works just as well as diesel; however, it is far more volatile. And, of course, I had no idea the switch had been made. So, to avoid picking up a rat instead of toilet paper, I lit a match. Then I found the paper, and flicked out the match and tossed in into the barrel. Unfortunately, the match had apparently not gone out. A big ball of flame shot up through the hole and began immediately to burn the four-holler down with me in it! The only thing I could think of to put a fire out with was water, so I ran back to the tent hitching up my britches and got my canteens and ran back to the four-holler and began to pour the pitiful little stream into the barrel half. It hadn’t even occurred to me that water won’t put out a gasoline fire. The effort wasn’t working. Finally, I ran around to the back of the four-holler and ripped the swinging door that covered the back of the depository off its hinges, and placed it over the barrel half. It worked; the fire went out. I went on back to the tent and went to sleep. The next morning, there was a stir like you wouldn’t believe. Everybody was looking for the guy who had turned the whole inside of the four-holler black! It was sooty from top to bottom, virtually unusable. You better believe that I joined in the search and beat the bushes with just as much zeal as the rest of them! The Seabees were some of the sorriest folks around, according to our way of thinking. They wouldn’t do anything unless you paid them something, and they were the ones who built four-hollers. We didn’t have anything to trade for one right then, and they had little sympathy for Marines who didn’t have any better sense than to burn one down, so they didn’t build us another. We were some dirty folks before we got out of there. I went into sales for a few years, and then went to seminary. I became a Presbyterian (PCA) pastor and have been ordained now for 36 years (the last couple of them retired). 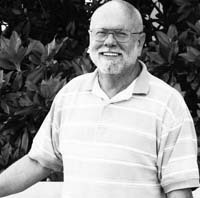 I live in central Mississippi, am still married to my first wife (45 years), have about nine acres where I keep a couple of horses and am enjoying life. God has been good. I am not a member of any. Probably ought to be; just never got around to it. Because of what we went through in Vietnam, I came home knowing in my heart that here was nothing required of any mortal of which I was not capable. The words, “I can’t” were no longer part of my vocabulary. After returning, I earned a Master’s and then a Doctorate – something I never would have thought I could do before I went over to Vietnam. I had gone over a grown boy and returned a man. 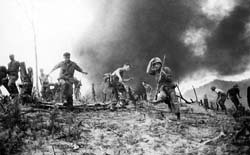 I had never missed a part of an operation, had lived up to challenges to run to the front in the face of enemy fire and do my job praying to God that He would get me through, and I had earned the respect of men of whom I had the highest respect – men called United States Marines. This can-do attitude has gotten me in trouble a few times and held me in good stead a few, also. I saw at least one really good leader – one apparently born to it – and some bad ones – men whose title of leader was limited to the fact that they had been given rank and knew the rules – and I studied and applied their differences to my life. I wouldn’t take a million dollars for my service with the Marines. It has given me something of which I have ever been proud and which I will take to my grave – the respect of men in the greatest fighting force in the world, a force known as United Sates Marines. Do everything you do at the best level you can. Get all the training you can. Volunteer when they ask for volunteers. Be a team player. Set the pace for others and then help them be their best. And stay in. Those 20 years will go by in a heartbeat and you will only be around 40 or so with a shot at a new career and the backbone developed by bearing the title of Marine. I don’t know that I have ever talked to another veteran who was glad he got out after just two or three or four years. We ALL wish we had stayed in for 20 at least. I always enjoy the stories of others with whom I have the common bond of having served. This site and several others have been useful in making connections with others with whom I served some 45 years ago. Thanks to TogetherWeServed for your role in getting so many of us back in touch over the years and the miles. Now, although I always feel just a little like a name dropper when I say it (remember, I never was a REAL Marine! ), nonetheless, “Semper Fi!” my brothers, wherever you are.